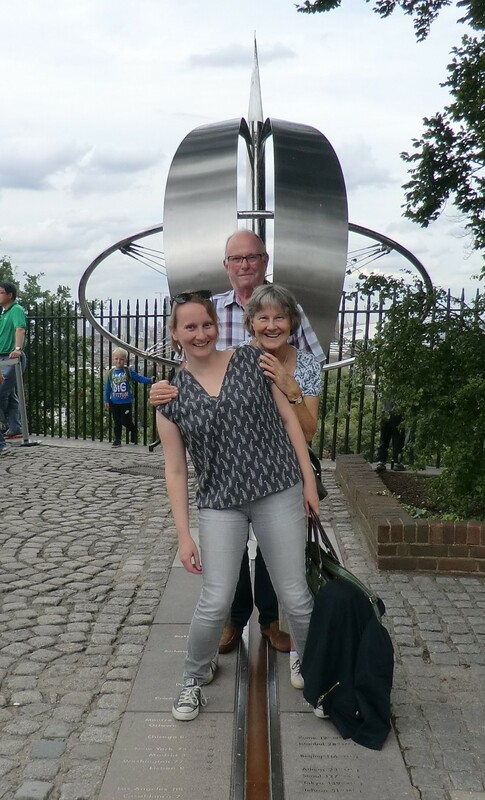 This weekend I took my parents to visit the Greenwich Meridian – or did I? The marked meridian on the site of Greenwich Observatory, where tourists line up to pose for silly pictures with one foot in the East and one foot in the West, has claimed to be zero degrees longtidude since 1884, but if you check your smart phone GPS on that spot, you’re NOT at exactly 0.000 degrees. According to GPS, the zero meridian appears to be in a park adjacent to the observatory, and not in the section behind the fence that charges admission so you can “visit the meridian”. Earlier this month, an article by Stephen Malys and others in the Journal of Geodesy revealed the reason behind the discrepancy. The technology used in the 19th century to determine the location of the zero meridian was subject to local distortions from the Earth’s gravity and shape of the local terrain. GPS technology uses measurements from satellites, which aren’t affected in the same way as technology located on Earth. The dotted line is the much photographed meridian established in 1884. The solid line is where the GPS says it should be. So the meridian really is in the wrong place. What does that mean for maps or for time? Well, the Ordnance Maps used in the UK were already using a slightly different zero meridian as reference point, because they were established before the 1884 meridian convention. And the effect of the new meridian location on Greenwich Mean Time, which determines Universal Time, is unnoticably small, so nothing much has changed. Except, for a shorter line and a cheaper visit, you could technically skip the museum and the crowd of tourists and find the true GPS meridian about a hundred meters to the East of the Observatory in Greenwich Park. It’s probably not as fun a place for a family visit, though. Aerial photo is Figure 1 from the article by Malys et al. (CC-BY). Photos taken from the ground are by me and by the man who was behind us in line at the almost-but-not-quite meridian line. I previously wrote about the history of the Greenwich Observatory on this site.